Treat your family to something special and move them into this beautifully-presented 4-bedroom 2 bathroom home that boasts an endless amount of living options, as well as a dream outdoor setting with "summer" written all over it. Gorgeous double French doors reveal a carpeted formal lounge-come-theatre room at the front of a highly-functional floor plan where solid timber floorboards help warm the main casual living zones. Overlooking a large sunken dining room is a stunning open-plan meals and sitting area that seamlessly incorporates an impeccably-renovated kitchen into its contemporary design - complete with sparkling granite bench tops, glass splashbacks, fridge plumbing, a walk-in pantry with power points and a fold-out ironing board, an appliance nook, a five-burner gas cooktop, a Blanco oven, Blanco range hood and an Omega dishwasher for good measure. 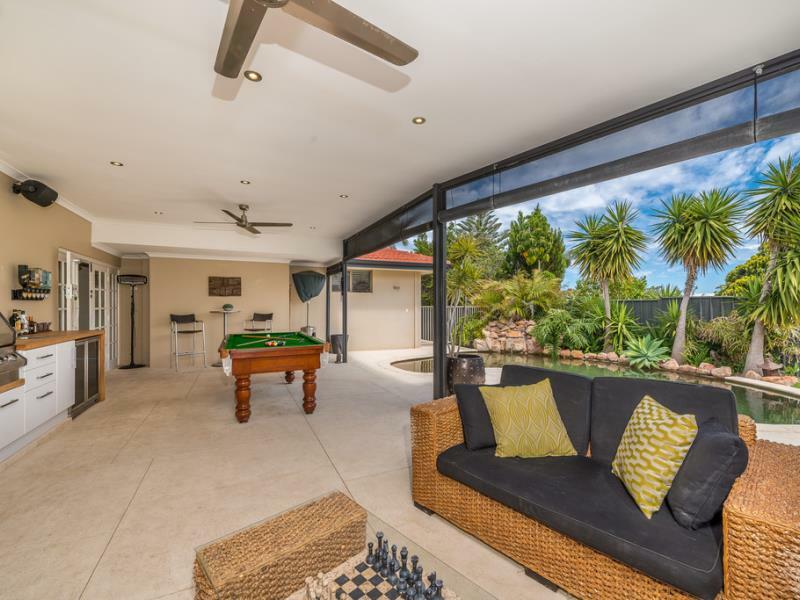 Like the adjacent dining room, a separate and spacious family room extends outside via its own set of double French doors that links the interior to a massive entertaining alfresco (50sqm approx.) 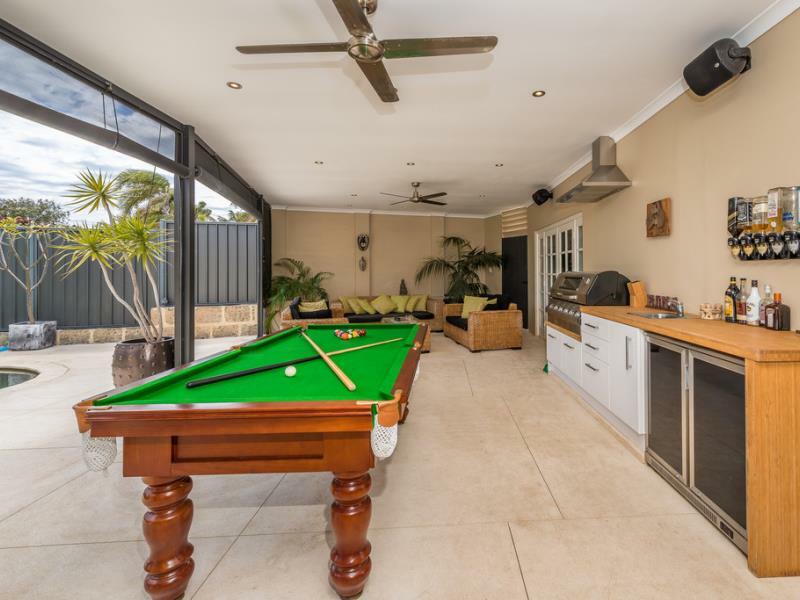 where caf blinds enclose the immediate area and protect your guests from the elements whilst complementing a built-in Everdure mains-gas barbecue, a range hood, a bar with a sink, two ceiling fans, audio speakers and feature down lighting to set the mood. 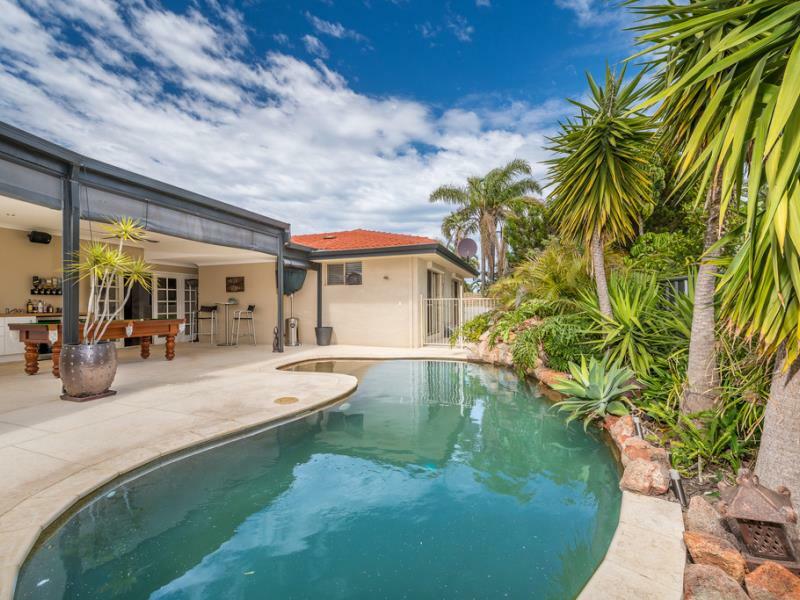 Providing a picturesque backdrop to it all is a shimmering below-ground swimming pool that is sure to make splash as you and your loved ones relax and unwind throughout the upcoming warmer months. Back inside, the bedrooms are all very generously proportioned, including a commodious master suite with its own private retreat area for mum and dad to quietly contemplate the day gone by, alongside full-length and height built-in wardrobes, a walk-in storeroom (with the potential to be utilised as part of a future bathroom extension) and a fully-tiled ensuite bathroom - comprising of a shower, toilet and heat lamps. Completing this wonderful package is a remote-controlled double garage with its own pool/garden shed for storage and a handy internal shopper's entry door via the family room. An approximate 10-minute walk to the Ocean Reef Boat Harbour and the site of the promising new local marina redevelopment is simply an added bonus, with this sublime property also finding itself in close proximity to a plethora of local parklands, Ocean Reef Senior High School, Ocean Reef Primary School, Prendiville Catholic College, St Simon Peter Catholic Primary School, Beaumaris Primary School, sporting and recreational facilities, Mullaloo Beach, Joondalup Resort and golf course, public transport, the freeway and excellent shopping at Currambine Central. What an exemplary lifestyle opportunity!